VaporDry™ is ideal for applications requiring high humidity levels. From meat processing plants, to warehouses, to coolers, VaporDry™ suits them all. During the primary chilling process, fresh carcasses are spaced in a room designed to slowly lower the core temperature. If the proper humidity levels aren’t maintained, costly shrink can occur. 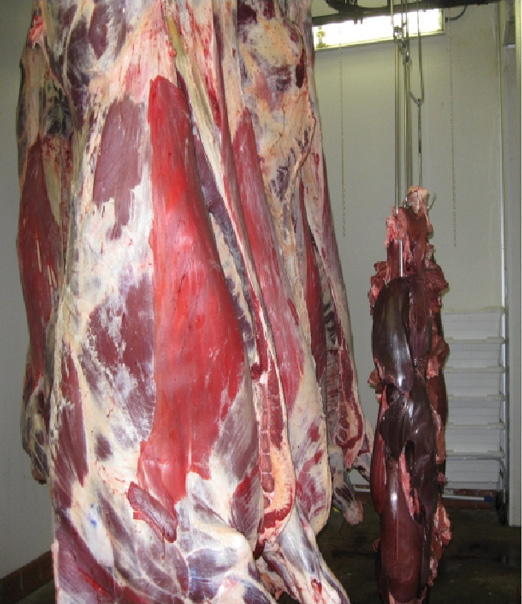 A recent beef carcass installation reduced the excess shrink from 3.0% to 1.5%. That’s a savings of $40.50 per hide on a 900 pound beef carcass valued at $3.00 per pound. Let the VaporDry™ system reduce your shrink levels and improve the quality of your product. Corrigan continues to innovate and push industry standards with its larger space humidity systems designed to offer high relative humidity by achieving a non-condensing dry fog. VaporDry™ produces the largest volume of dry fog from a single nozzle and a water droplet size as small as 2 microns and consistently well below 10 microns. VaporDry’s optional humidistat precisely detects %RH, turning on and off only when needed. With multiple control options, it can be customized to meet your specific humidification needs.